John Wentworth. Sans road rash. Mammoth’s Mayor John Wentworth asks: Who are we? Where are we going? How do we get there? Mammoth’s Mayor John Wentworth showed up to his interview with a gnarly case of road rash on his face—he’d been up at Tamarack for an early morning skate ski and had taken a tumble. It happens to the best of us. “Do you think I can show up at a meet the candidates forum like this?” asked Wentworth, the gash on his forehead covered by a Mammoth Lakes Trails and Parks Association (MLTPA) hat and the shiner on his cheek partially obscured by sunglasses. Well, at least the injury shows that Wentworth, who has built his political career out of his passion for outdoor recreation, walks the walk. 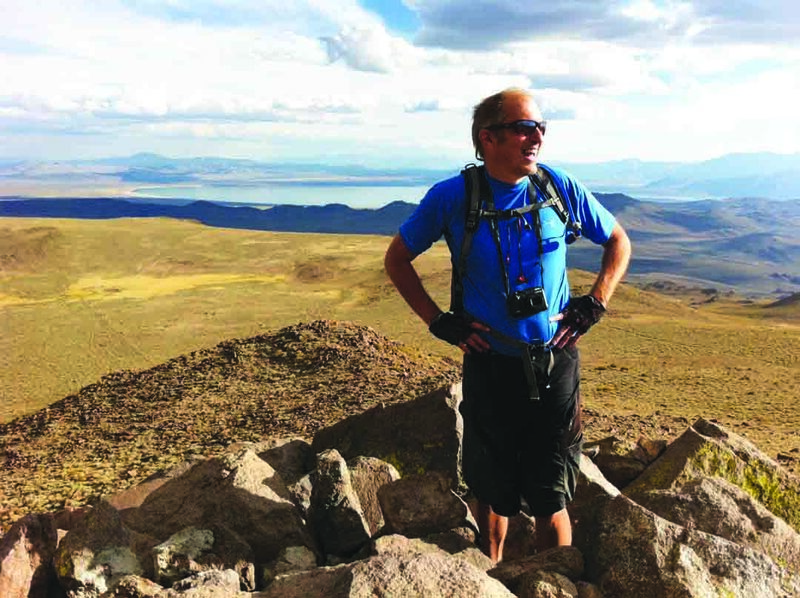 Wentworth was elected to Mammoth’s Town Council in 2014, but his political story begins in 2005, when the avid backcountry skier heard that the then-Town Council was planning on restricting backcountry skiers’ access to the popular Sherwins. “There was a parking problem out there, and skiers were walking through people’s yards” on Ranch Road in Old Mammoth, said Wentworth. He and several other backcountry enthusiasts went out in December blizzard conditions and gathered 800 signatures to plead for access. News coverage followed (The Sheet covered the story, as did Powder Magazine). An easement was ultimately negotiated that is now included in the Snowcreek VIII master plan to ensure public access. Wentworth went on to lead the campaigns for local ballot initiatives Measures R and U, before eventually running for elected office. Why is he running for another term? Wentworth says three big questions are the core of his candidacy: Who are we? Where are we going? How are we going to get there? So who are we? A mountain community that shares the challenges of other “island” communities like ours. Housing, climate change, and the problems and benefits afforded by being surrounded by public lands are all common themes in these types of communities. Where are we going? From a public lands perspective, Mammoth is on the forefront of a sea change, Wentworth says. The Inyo National Forest is an “early adopter” of the national Forest Plan Revision, informed by the Framework for Sustainable Recreation (see “The Future of Sustainable Recreation,” June 11, 2016). “We are now in a new set of conversations with a new set of peers [which] self-identity as ‘mountain communities,’” says Wentworth. He says his Council has added three crucial forward-looking components to the many plans that Mammoth is trying to implement: The Walk, Bike Ride program, the Downtown Revitalization Plan, and the Community Housing Action Plan (“probably the most important piece,” Wentworth notes) are all visions the current Council have prioritized. Council candidate Kirk Stapp says that the Town paid too much for the Shady Rest Parcel, which is zoned for affordable housing (see “Council Veteran Hopes to Return,” April 6). Wentworth says that without Council’s action, “those 200-some owners [of the Shady Rest parcel] would have been happy to sit back and pay their 1/200th of the property taxes” and let the land sit fallow. And how are we going to get there? Action, Wentworth says. Anyone who has sat down with the Mayor for a coffee gets a sense of his almost insufferable optimism (he hates to hear the word “cynical”).